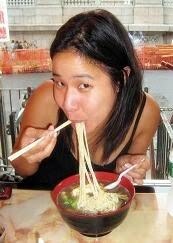 Part of my birthright as a Chinese person is a certain fearlessness when it comes to trying unusual foods. Head-to-tail eating, stinky, fermented flavors, gelatinous, gooey textures, I say: bring it on. My ex-boyfriends, not so much. My sister and I once ordered this delicious, but somewhat pungent fried rice at a meal with our two boyfriends at the time. Both guys took one whiff and told us we were welcome to all of it. "It smells like feet," my date added, just in case his unmistakable "eww gross" face had gone unnoticed. Luckily, I've moved on to a more stink-tolerant significant other (in fact, being French, and a cheese fiend, you could even say he's stink-seeking). The salted fish is actually far more subtle than it smells, adding depth and dimension to an otherwise plain dish. The effect is very similar to the salty dose of anchovy in a good Caesar dressing. And in fact, this dish also features Romaine lettuce and eggs, so you can almost think of it as a remixed Caesar salad. 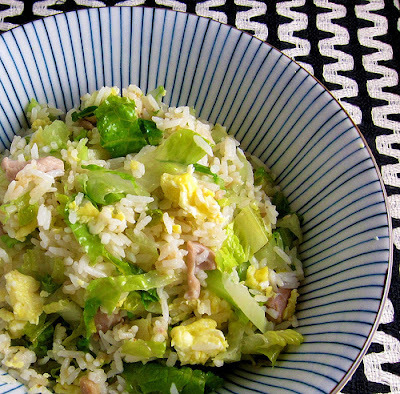 The key to any fried rice is to cook the rice 1-2 days in advance. This allows the rice to dry out a bit in the refrigerator, so it can fry properly. The fish is available, unrefrigerated, in most Chinese markets and will come in a plastic bag like the one pictured below. I have not personally tried this, but it's my hunch that a tin of anchovies would also work perfectly in place of the salted fish. 1. 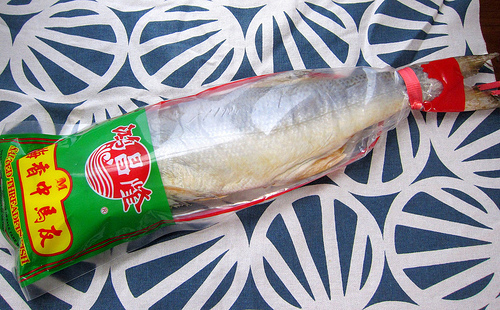 Prepare the salted fish by cutting off a chunk that's about the size of a deck of cards. The remainder of the fish can be stored in a Ziplock bag (you may want to double bag it to prevent the smell from taking over your entire fridge). Soak this chunk in warm water for an hour or two. When it's finished soaking, pat it dry and dice it into small pieces. 2. Gather all your ingredients near the stovetop. In a wok or large pan, heat up a splash of oil and quickly scramble the two eggs. Remove to a plate when the eggs are just cooked through, but still shiny and loose. 3. Heat up another splash of oil and add the fish and ginger to the wok. Give these a quick stir, then add the chicken pieces. Cook these together for about four or five minutes, until the chicken is nearly cooked. Then add your rice to the pan, along with another splash of oil if necessary. Add a generous pinch of salt and move the rice around in the pan, breaking it up and making sure the grains get coated with the ginger and fish-infused oil. You want to actually fry the rice, getting it nice and toasted from the hot pan, so keep stirring to make sure every piece of rice comes into contact with the cooking surface. 4. After 3-4 minutes of frying the rice, slide the cooked eggs in and break them up. Then add the shredded lettuce and green onions, stir until just wilted (about 30 seconds), and remove from heat. Serve immediately. You can serve this with fermented bean curd for a double dose of stinkiness. I love most types of salted fish...well trained from young :D They make very good fried rice. Yours look very delicious. Just came across your site - loving your recipes as they're very much like what I cook at home! What are some of your favorite things to cook at home? I'm always looking for new ideas! This is one of my favorite dishes! I personally think it is so much better comparing to the usual chicken/ shrimp fried rice! mmm...this was a favorite of mine back East. I'm gonna have to whip some up now! Nice work.